On Device Research has today released a report that highlights the unconscious impact of digital advertising. The findings reveal that consumers who have been exposed to digital ads but who don’t actively recall having seen them, still record uplifts across a range of brand metrics: from an average increase of +10.2% in Unaided Brand Awareness to +1.6% in Purchase Intent. In other words, digital advertising works, even though you may not know or remember having seen it. An analysis of ten digital ad impact studies across seven advertiser categories and 3,000 consumer responses has enabled us to shed light on this issue. By tagging campaign creative and visualising digital exposure on our consumer panel we can compare brand metric scores among those who we know have seen an ad but don’t recall doing so, and those who we know have seen an ad and do recall doing so. Our memories are not perfect: Most people don’t recall the ads they have been exposed to. In fact 76% of people who we know have been exposed to test ads, claim that they haven’t seen them in the last 30 days. Brand impact therefore happens for most people passively, highlighting how important it is to measure alongside ad recall. Digital ads have impact passively: Those who don’t actively recall seeing test ads still drive brand metric uplifts throughout the purchase funnel vs those who we know definitely haven’t seen test ads. On average we see uplifts of +10.2% increase in Unaided Brand Awareness; +5.9% in Top of Mind Awareness; +2.3% in Brand Consideration; and +1.6% in Purchase Intent. 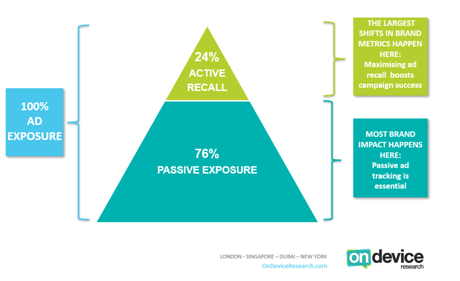 Significant brand multiplier for actively recalled ads: Despite the fact that brand impact happens for most people at the passive level, when ads do cut through and are actively recalled they can drive a significantly higher impact. 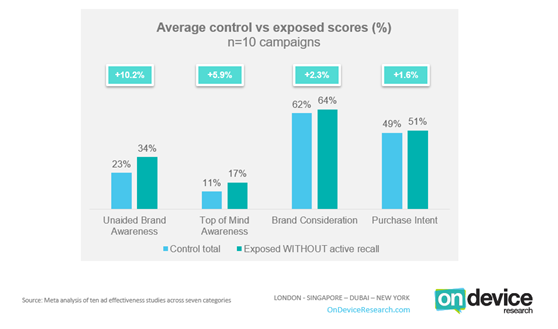 Amongst the 24% of our sample who actively recalled seeing the tests ads that they were exposed to, they drove shifts in awareness metrics three times higher than the passive exposure group; along with six times greater shifts in Brand Consideration and seventeen times greater shifts in Purchase Intent. Indicative analysis reveals that those who actively recall ads are far more likely to be existing brand customers, so while ad cut through matters, it is likely to be your existing customers who will be most primed to recall your ads. Passive ad measurement matters: Much of ad measurement still relies on the imperfect human memory to record ad exposure. Many brand tracking studies and ad impact measurement solutions determine who has and who hasn’t seen advertising through simple ad recall questions which ignore the effect that advertising has on those who do not actively recall having seen an ad. To ignore the impact on those who do not actively recall ads results in an under-estimation of total campaign brand impact. Passive measurement should not just be confined to the digital space either. ACR (audio content recognition) technology can be used to measure TV and radio exposure, while geo-location data enables us to track exposure to out-of-home media. To find out more about the brand impact of passive ad exposure, you can find a copy of our report here. Please join us for a webinar at 2pm on 13th September where the On Device Research team will be discussing the findings from this reporting and its implications for cross media ad measurement in more detail.